"Staff were quick to move us to another hostel"
Have a question for Travellers Nest Hostel? "Great location near beach, local market and main road with buses." 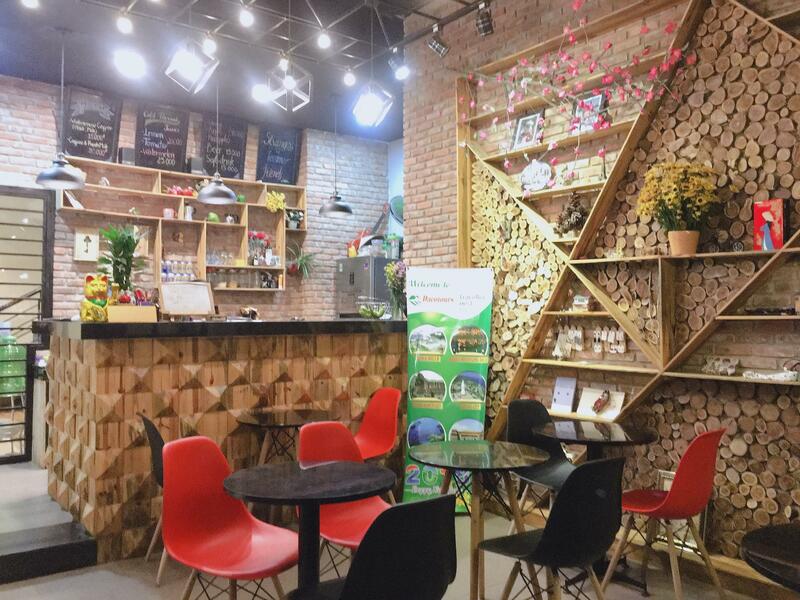 Built in 2016, Travellers Nest Hostel is a distinct addition to Da Nang and a smart choice for travelers. Only 4km from the city center, the hotel's strategic location ensures that guests can quickly and easily reach many local points of interest. With its convenient location, the hotel offers easy access to the city's must-see destinations. The facilities and services provided by Travellers Nest Hostel ensure a pleasant stay for guests. A selection of top-class facilities such as free Wi-Fi in all rooms, 24-hour security, daily housekeeping, taxi service, ticket service can be enjoyed at the hotel. In addition, all guestrooms feature a variety of comforts. Many rooms even provide television LCD/plasma screen, clothes rack, linens, locker, mirror to please the most discerning guest. Besides, the hotel's host of recreational offerings ensures you have plenty to do during your stay. With an ideal location and facilities to match, Travellers Nest Hostel hits the spot in many ways. "The staff were amazing and very helpful." To be honest,it’s the best hostel I have ever seen during my one-month trip in Vietnam. Three aspects impressed me a lot. 1. All staffs are very nice and warm-hearted,they helped me with all my problems.Loan helped me solve some problems about Simcard LTE and Quynh helped me buy a laptop.Their kindness and beauty made me love Danang more! 2 The bed is the best one I have ever seen.Nearly every traveler living here said like this. 3. The breakfast is so nice.,and WiFi here is very fast.I must come back without more words. Staff were quick to move us to another hostel (dango) when our air con started leaking. Good sized rooms in both hostels, both clean and the staff can't do enough for you. Dango had the better location though, but both had amazing breakfasts. Good roof terrace but it rained for two days straight for us. Close to the beach and places to eat but we just stayed in the room as it rained unfortunately... Good breakfast and very nice staff. Room was clean and bed was comfy. Everything here is nice and the staffs are so friendly.Every morning Linh and Shasha made breakfast for us and it’s very delicious.They are really nice!Highly recommend! Good location in a quiet area of Danang, about a 10 minute walk to the beach and to the main restaurants in the area. There are small lockers available for your valuables in each dorm with free breakfast in the morning and free wifi. Staff are very friendly and there is someone available 24/7 on reception however if you are outside, the main gate closes at night so you need to ring the buzzer so that someone can let you in. The guys there are so kind. A beautiful girl told everything she knew when I traveled all over the Vietnam. The breakfast is free. There’re kinds of breakfast you can choose. It’s so delicious. I’m looking forward to live there again. A very nice experience. Hello Xinwu! I'm Joy:)) How is it going? You and ur friends are really nice and cute. We are happy when you like our breakfast. We really appreciate your nice review. Thanks for choosing our hostel, we always try our best to make you feel comfortable when you stay here^^~ can't waiting to see u againnn~~~ Thanks again with the warmest wordsl!^^~ Hope to see you again, Valerie! The hostel is located on a quiet road but it’s not far from the beach or the main road. The staff is incredibly sweet and helpful in booking your onward travel or for daily motorbike rentals. They’re always interested in what your plans are in order to help you make the most of your stay. The rooms are a good size, beds are comfy. Heads up, you have to preorder breakfast the day before. Would recommend! Hello my friend ! How is it going, Alessandra? You are really nice and cute. We are happy when you give us a chance to be with you in Vietnam. We really appreciate your nice review.Thanks for choosing our hostel, we always try our best to make you feel comfortable when you stay here^^~ Thanks again with the warmest wordsl!^^~ Hope to see you again, Amanda! I loved this hostel. The bunks were big and private. Breakfast was delicious and the manager is the sweetest and friendliest person ever! They were super accommodating and always willing to help! And it’s located very close to the beach and a local market. Hi Jessica, Thanks for choosing our hostel, we are really glad when you like our hostel . You are really nice. We appreciate your nice review. We usually try our best to make you feel comfortable when you stay here :))) Thanks for your warmest words! Hope to see you again! Honest review - I love the female dorm and the rooftop garden! I love how they provide the blinds instead of the normal curtain for each bed in the dormitory and I love how each bed has a small table and cabinet attached to it and also I love how they provide hangers for us to hang our clothes! Even tho the location is not the best (far from the river and the city), I love how we can meet other travelers here at the hostel. They are located only 100m from a convenience store too so that is very helpful! Toilets are clean and I love how they play music in the bathrooms. Hi Ainil, We hope you are fine. Thank you so mcuh for your good review. We really appreaciate it. Hope you can have a happy life with your friends and your family. See ya one day. This is the best hostel I have ever stayed in Viet nam. The bed is very big. The breakfast is really excellent. You have many choices for breakfast and you can change everyday. The hostel is clean. It nears the beach and the city. The staffs here are so helpful and friendly. I will come back here. Great location near beach, local market and main road with buses. Unfortunately, the sleeping areas and bathroom are contaminated with black mold. In addition, washrooms and shower area is poorly designed, too small for the number of guests and men and women share one common washroom and shower area. Hi, Thank you for staying at Travellers Nest Hostel and taking your time to share your experience here. It is our happiness to learn that you experienced and enjoyed all facilities and services whilst in residence. Unfortunately, in this humid season, it is quite difficult not only for us but for other hostels to control the effection from external. We hope to have another pleasure of welcoming you back and being at your service again in near future! Wish you all the best! Best Regards, Joy - Staff of Travellers Nest Hostel. The staff working here are what makes this hostel so special. They really care that you have a great time here and that your stay is comfortable. Whatever you need, whether it be a motorbike or a bus to another city, they can arrange it for you. Their breakfast is delicious. The location isn't too far from the beach (about 15 mins walk or 5 mins by motorbike). There's also a local market nearby if you fancy some local dishes and fruits/vegetables. I loved everything about this place. Hi friend! Thanks for choosing our hostel. You are really nice and handsome:)). We are so happy when you like our hostel. You're like our family member. We usually try our best to make you feel comfortable when you stay here. Best wishes! Hope to see you again, Dan ! When i arrived the hostel,the room of my booking got some issue.then they change me to another hostel which belong to same owner ~dango hostel the brand new hostel which will grand openning at 1/9/18.the staff there are nice.which will give you some suggestion on you trip.they will get remember you name. definitely you will enjoy over there.thanks to SA and tracy. Keep it up ,im enjoy over there. You can meet new friend over there, Then your jouney will be great. I meet a canadian,japanese guy and a beauty romanian...they make my day. The staff here make an extra effort to get to know your name and to use it. You can order from a breakfast menu the night before (if your schedule permits). Most importantly, the bunks in the dorm are enclosed with walls on 3 sides and a retractable blind on the 4th side. There's no disturbance when neighbours come and go, early or late. The staff were were just the best! they arranged a bike for us and talked us through all the places nearby we should visit! The room was also great with a large balcony and windows with lots of light. Lots of options for breakfast and a quiet hostel so you could get a good nights rest. Hi Laura! Thanks for choosing our hostel. You are really nice and cute:)). We usually try our best to make you feel comfortable when you stay here! We miss u:)) Hope to see you again, friend! Tracy is very friendly, we are friends now. The location of this hostel is good, near the bus stop and a local market. You can also easily walk to beach. I love the breakfast, a lot of choices. The room is clean; bed is comfortable. I'll recommend it to my friends. I really loved this place, Staff were really nice. The breakfast included was amazing and you can choose from a lot of options. The rooms are nice and clean , you can have a private time with the roller curtain . The only negative I have to say is, it wasn't a very social place to make friends no one was really talking to anyone. But the STAFF where very FRIENDLY :). I'd come back if I needed to go to Da Nang Airport as its only a 14 minute drive! We booked 1 night and ended up staying 5 or 6 in this cute, clean and modern little hostel. The owner / manager was really friendly and helpful. The free breakfasts were nice as were the rooms. It was clean, with fresh towels everyday, had a nice rooftop area. The best part was making friends with the staff who were always joking with us, took us out to a famous local seafood place and gave us little gifts when we left. Hi friend! :))) Thanks for choosing our hostel. We will miss you very much. You are so friendly, nice and look like our family. We usually try our best to make you feel comfortable when you stay here. Best wishes! Hope to see you again, David!